I wish I could write here “Veni, vidi, vici”, but I’m only limited to “I swam, I biked, I ran, and I finished”. Which is not that bad either. There is actually very little I can write here about. It was quite uneventful. Compared to Silverman, there was no winter storm with strong winds and large waves at the lake, no cross winds or hale on the bike trail, or freezing rain at the run course. Only usually beautiful Californian weather with low 50 F at night and mid 70 during the day. Wonderful weather for outdoor activities. Weather was “just right”. Only water in the lake was rather cold (62F) and thus wetsuits were mandatory. We did this race together with Todd Skaggs, a friend and colleague from US Salinity Laboratory (an author of the famous drip irrigation paper), whose participation helped me a lot in training, to stay focus on the race and not to cancel it early. In an email, organizers informed us that the race starts at 8:00 a.m. and that the winners’ ceremony starts at 11:00 a.m. Since we thought that it would be unpleasant to be still on the road when the ceremony starts, we set our goal to finish before the ceremony, i.e., under 3 hours. 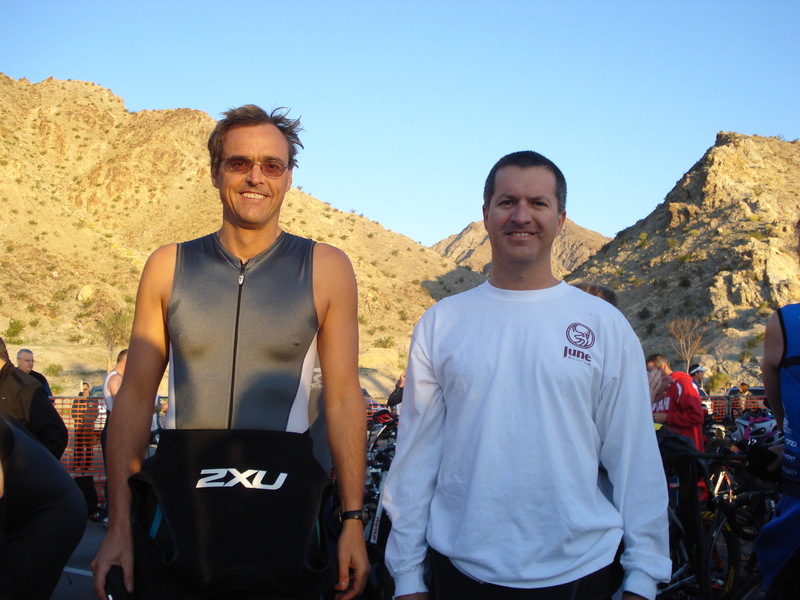 Since for both of us this was the first ever triathlon, we did not actually know how easy or difficult this would be, but both thought that this should be doable quite easily. However, the day before the race, organizers changed the program and announced that the ceremony will start at 10:30 a.m. That obviously put much more pressure on us, since now we had to finish in 2:30 h and that did not seem that easy anymore. That would be a bad day if they were announcing results of the race we were still in. My strategy as usually turned out to be wrong. While before the Silverman I had practiced sighting during swimming, this time I did not bother with it. While during Silverman the water in the Lake Mead was quite clean and it was easy to simply follow under water the fellow swimmers to get the right direction and one could even draft after someone else, in the Lake Cahuilla the water was so murky that one could not see even his own hands. Therefore one did have to actually look for buoys and drafting was out of question. But that was the only problem during the race. I think that I did relatively well, considering my age and this being the first triathlon, especially on bike, considering that I got my bike only about a month ago (while spending for it more money than for my first car in States), took four rides outside, and did not especially fall in love with cycling, still being horrified with any need to get my boots in and out of the binding, without embarrassingly falling. Both bike (my average speed was 33 k/h) and run parts of the triathlon were uneventful. I did not know what to expect after transition from bike to run (not practicing both disciplines right one after the other), but it was not that difficult as I thought. It took only about 200 m to get into a good running rhythm. Keeping my good tradition of accomplishing my goals with the minimum amount of energy used (see my under-4-h marathon in San Diego), I have finished in 2:29:53 s. This was close! Had I not taken naps during transitions, I could have finished a little better.